PHSO Pressure Group Report into reform of the Ombudsman. THE PARLIAMENTARY AND HEALTH SERVICE OMBUDSMAN: CORRUPT BY DESIGN? The Parliamentary and Health Service Ombudsman is not fit for purpose. It fails to provide remedy and justice to thousands of citizens, delivering instead further emotional damage as their complaints are denied honest investigation and remedy. This has been confirmed by two hard hitting reports from the Patients Association PHSO-The Peoples Ombudsman- How it Failed us in November 2014 and PHSO-Labyrinth of Bureaucracy in March 2015. The investigation to find maladministration model is flawed and does not take into account injustice caused by poor discretion. The public have no confidence that the Ombudsman will resolve their issue with 64% stating that making a complaint will ‘make no difference’. Over 98,000 people have signed a Which? petition to improve public service complaint handling indicating significant public concern. Current legislation allows the Ombudsman to be unaccountable to the public, to the courts or to parliament in any meaningful way. (Table C) This has allowed the Ombudsman to act with impunity against the interests of the public and protect public bodies and NHS trusts from proper scrutiny and sanctions. In January 2015 the Health Select Committee recommended an external audit of PHSO decisions and investigations reports to assure quality. (Para 91. Complaints and Raising Concerns. This has yet to be implemented. The Parliamentary and Health Service Ombudsman does not provide good value for money when compared with other Ombudsman services. 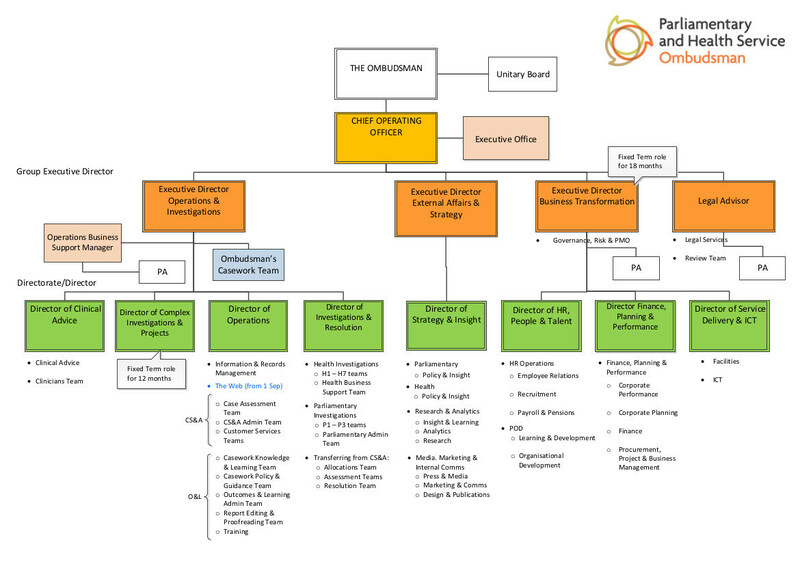 It has an increasingly top heavy management structure (p.5). Since Dame Julie Mellor took office in 2012 costs have increased by £2 million each year despite staff levels remaining static. (Table F) PHSO does not score highly on efficiency, effectiveness and economy. The primary solution is to ensure that the new legislation for the Public Service Ombudsman is robust, to provide the public with remedy, drive reform in public service delivery, whilst giving efficiency, effectiveness and economy to the government. This will require open public and parliamentary debate. Along the lines of the recent PASC report, Time for a People’s Ombudsman we suggest that the present Ombudsman service is divided to provide a designated Health Ombudsman for England, in line with devolution and a separate Parliamentary Ombudsman for England and the UK. Staffing levels and expertise should be considered to ensure that the primary role of investigating complaints is given priority over management positions. Health Service Investigators should have clinical experience and senior members of staff, including the Ombudsman should have legal training. Health cases need to be dealt with swiftly to ensure patient safety issues are addressed and far fewer should ever reach the Ombudsman at all. We suggest restoring a second tier for NHS complaint handling using independent, local review panels. These panels would provide speedy resolution, feedback valuable information into the NHS Trusts and allow the Health Service Ombudsman to deal effectively with the greatly reduced number of cases which require final arbitration. All complainants should be offered expert advice and independent advocacy. Changes in legislation should remove total discretion from the Ombudsman and instead stipulate specific roles and responsibilities, in line with the recommendations of the Patients Association. This would include a definition of ‘maladministration’ and enable the Ombudsman to consider poor use of discretion. External audit of decisions and investigation reports should be implemented in line with the Health Select Committee report and an annual review made public. PACAC or a similar cross-party parliamentary committee should have real powers to hold the Ombudsman to account for poor service delivery. PHSO should not be responsible for handling complaints made about their own service. There should be access to external review and unresolved complaints about service delivery should be taken up by the constituent MP and/or by PACAC as part of an annual review. 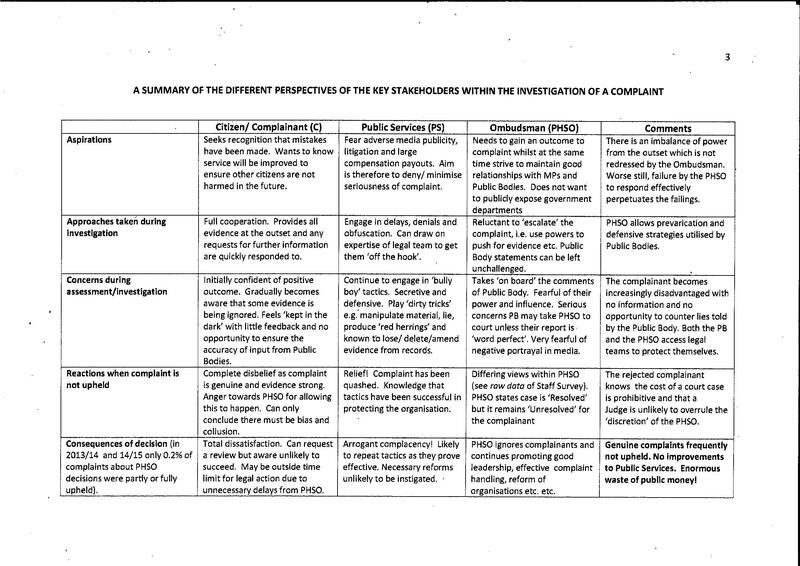 The total number of complaints received by PHSO, the type of complaint and the number upheld should be displayed prominently on the Ombudsman website in real time. All complainants should have automatic access to the customer survey with no barring facility available for the Ombudsman under any circumstances. PHSO must become open and transparent. All clinical advisors used should be disclosed. All parties should receive copies of the evidence supplied at every stage of the process. Both parties should receive copies of the draft report simultaneously for comment. There should be the option for face to face meetings. New systems of ADR and mediation should be used by the Ombudsman negating the need for full investigation for some cases. PHSO must do more to obtain withheld evidence from public bodies. Where medical records and other key documents cannot be provided this should constitute automatic maladministration. The Ombudsman should work on the principle of ‘presumption of honesty’ on the part of the complainant. It should be for the public body to prove a complaint is unfounded rather than for the complainant to prove the case with restricted access to evidence. *Difficult to accept that complaining makes a difference when over half were denied any uphold or remedy. *117 days for the investigation plus an average of 47 days for initial assessment and 76 days waiting for the investigation to begin. FOI requests resolved 332 339 261 ? ? ? PHSO handle all complaints internally. 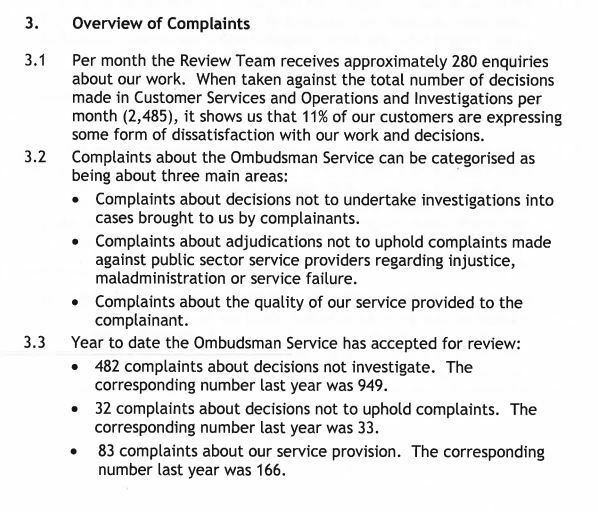 It would appear that number of complaints has reduced year after year or could it be the case that PHSO dismiss many complaints without investigation and fail to record these in their annual review? See excerpt from Mick Martin, Deputy Ombudsman Report March 2014 below. Based on these figures PHSO receive approximately 3,360 complaints per annum but accepted only 17.7% of complaints for investigation in 2013/14 and only the accepted complaints would be recorded in the Annual Report. In 2014/15 PHSO exceeded their Net Cash requirements (See Annual Report statement below) Since Dame Julie Mellor took over as Ombudsman in January 2012 costs have increased by £2 million per annum, although staff costs have stayed the same. Does PHSO operate with efficiency, effectiveness and economy? The 2014-15 audit of the accounts by the National Audit Office identified that we had exceeded our net cash requirement in 2014-15, as a result of inadequate cash flow, forecasting and monitoring. This led to an overdraft on our bank account at 31 March 2015. By exceeding the net cash requirement, we have exceeded the limits voted by Parliament, leading to an automatic qualification of the accounts. An investigation by our internal auditors into this has shown that we had inadequate cash flow forecasting in place during the year, with inaccurate reporting to the Board against the cash control. In part, these failures were due to high staff turnover within the finance team, resulting in vacancies in all senior finance positions. Under the leadership of the new Executive Director of Finance and Governance, we have taken immediate action to strengthen the financial control framework and ensure robust reporting and assurance on financial matters. In 2014-15 we also reduced our accommodation requirement and sub-let the accommodation we vacated in order to reduce our costs and increase value for money. Because the rent we are receiving does not fully cover the cost to us of the accommodation, this has created an onerous lease, and in accordance with proper accounting practice, we have created an onerous lease provision within the 2014-15 accounts. Because we did not secure provision for this in our Supplementary Estimate we have exceeded our AME limit, which has resulted in an automatic qualification of the accounts.